Yella is a beautiful doll sculpted by talented German doll artist Sieglinde Frieske for Schildkrot. She has big blue glass eyes that are fixed in position and a long hair red wig. She is fully vinyl and has articulation at the head, shoulders and hips. She can hold her head in many positions. She stands up and sits down with legs out in front. 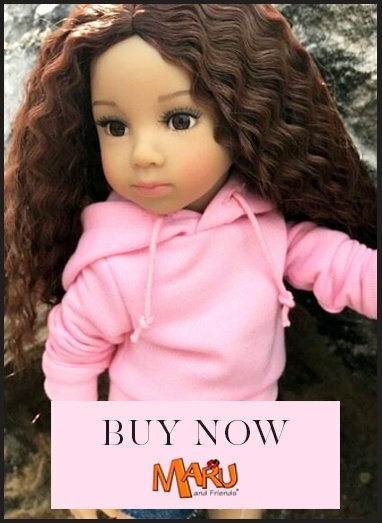 She's an absolutely beautiful doll, made with quality workmanship. Yella with red hair is wearing an ochre knitted sweater over a white shirt; a pair of pald flared trousers and a denim hat. On her feet she wears white pumps. Suitable for age 3+ but best for ages 5 and over.